Home › Pedagogy › Technology Theme: Digital Media is a catalyst for change! Technology Theme: Digital Media is a catalyst for change! As a computer teacher, I really do believe I have the best job ever. Don’t get me wrong, I’m an optimist and always love what I currently teach. When I taught physical science I felt I had the best subject ever as well. I loved the “Aha!” moments that students felt while doing labs, I loved connecting students with the scientific method and turning their brains into young scientists. Since I teach computers now, it’s not surprising that I feel the same way. This year I have been teaching the subject matter in a unique method that I haven’t before. I have been teaching fundamental skills through one theme: Digital media is a catalyst for change! Everything we do resonates this theme and it is my goal that students understand that they themselves can create digital media which could be exactly that. 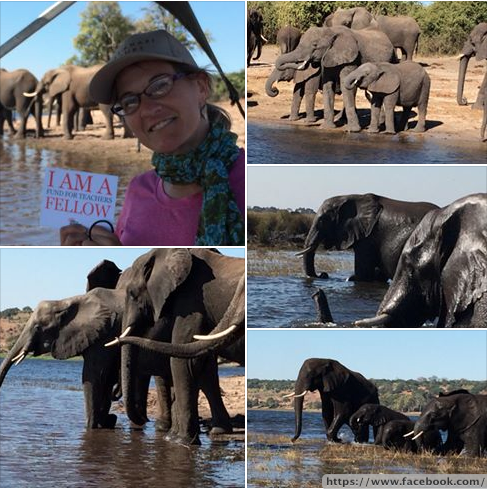 I went to Africa last summer, I was fortunate to receive a Fund for Teachers Fellowship. (This was a life defining fellowship, and has been critical in my teaching, if you have not applied before, I would be glad to give you some ideas and help on applying for 2016). In my experience in Africa I went on 2 safaris in Kruger National Park in South Africa and Chobe National Park in Botswana and saw some of the most majestic wildlife I have ever witnessed. I was only 20 feet away from a large elephant herd swimming across the river to eat on the grass there! I didn’t know that elephant swam either until I saw it with my own eyes; they use their trunks as a snorkel, it’s quite amazing to watch. I have a passion towards elephants and I am saddened that so much poaching goes on in the world. Wild elephant numbers are at their historical low and If we do not do something there may be no more wild elephant in the world in 20 years. I find it exhilarating to share this passion with my students. I teach students to use computers to create media. To teach them this, we do a lot of research to gather internet resources. Indeed this past semester, I also used internet applications to teach students about how smart elephants are. I uploaded this article to Actively Learn and students learned how to collaborate online through annotating text, collaborating with their group, and answering questions on this platform. After watching the news report my class was engaged in collaborative conversations on how media leads to changes. But we continued to learn from media as students took notes of a National Geographic series on Youtube regarding the Ivory Trade. Through all of this I was able to show students various media that was used Articles, infographics, new-stories, documentaries regarding a subject that I am passionate about. From this topic we read an article by National Geographic about kids taking action to stop the illegal ivory trade. The students in Hong Kong are only 9-12 years old but they are making a difference mostly through media. My students used this article to create a timeline (see the timeline creator blog that I wrote earlier this month for more information about this amazing platform which helps students figure out the main idea using 50 character snapshot summaries). Currently students are using all of their research to finish up a newsletter about elephants. The newsletter has their timeline on it, their articles about how elephants are so smart, a word cloud, a word search using Puzzlemaker, a poem, and articles about the media’s affect on making change for circus elephants as well as an article about the Ivory Trade. My students used media to create media. We’ve learned what some students are doing to make a difference, and students now are discussing the idea of adopting an elephant and raising money for its care. The next step in further development of our classroom theme is to introduce blogging to my students. I plan to encourage them to find a topic that they really care about that they can keep up on and share with the world. They will have their own chance to use the media and their blogs could have an affect in making positive changes in society. But of course this is the making of a future blog. ‹ How to Start in Coding: No Fear!